When their lives intersect in an unsavory hotel with a bloody history, all three will struggle to exorcize their personal demons, unaware that a bigger threat is looming . . . and waiting for the right moment to strike. 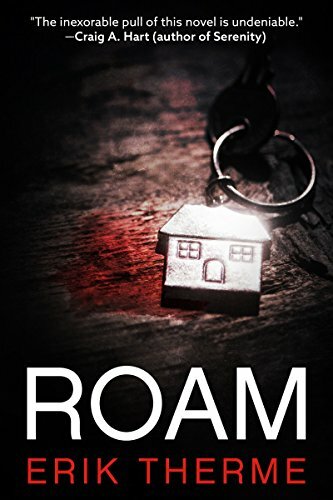 I like mysteries/thrillers/suspense books that carry all the way through the book (ie they don’t fizzle out by the halfway point) and Roam certainly does that. From the first page, when we meet Sarah and Marc to the very last page where a surprise twist is revealed, Roam kept me on my toes, wondering what was going to happen next. What I enjoyed about this book was that the characters were real. Sarah was in a relationship where her boyfriend was slowly isolating her, Kevin was abused by his father and Scotty was dealing with some pretty serious issues that were affecting him mentally. I will admit that Sarah kinda annoyed me at first. She was super impulsive (hello, getting into a car with people she doesn’t know) and made emotional decisions (the confrontation with her mother). But the more I got into the book, the more I started to not only like her but felt bad for her at the same time. Kevin, I actually liked. He was such a sweetheart. I mean, who would take a girl that he barely knew on a mission to find her long-lost friend? Plus, he was tough. I mean, he took on 3 people outside a bar and barely got hurt. When I read that, I thought to myself “Dayum. Sarah, he is a keeper”. Scotty scared me. But at the same time, while he frightened me, I felt really bad. He was dealing with so much and it seemed like no one in his life, even his girlfriend could care less that he was hurting and that there was something going on with him mentally. The more his story went on, the more fragmented it became if that makes any sense. The climax of the story (not the end, the climax) was very frightening and the author did a great job hiding the identity of the mystery man. I wasn’t surprised at who it was but I was surprised at what happened (want to know what happened….read the book). Now the end of the book took me by surprise and I went “No way”. All I am going to say about that!! Why: This book is truly one that will keep you guessing until the end and then some. The ending was a huge surprise and to be honest, it is what made the book! !